I found the bottle on the kitchen counter one morning as I was preparing to leave for work. No note. Just sitting there. One of my family had arrived the night before and (I assumed, due to the specific location of the bottle on the kitchen counter) had left this as a gift for me. “Jim’s Own Sauce.” I read the yellow label featuring a smiling pig with a top hat. Barbeque sauce. Made in North Carolina. From the orange-ish reddish color of the sauce, I guessed it would be Lexington-style. I enjoy barbeque sauce (excluding mayonnaise-based sauces… can’t tolerate ‘em). 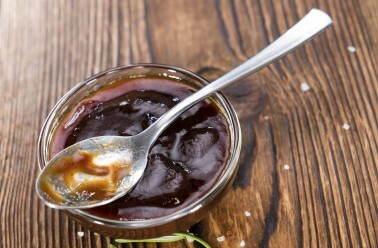 Since I’m an intermittent carnivore, I (please don’t feel disgusted) enjoy barbeque sauces on vegetables and as snacks straight out of the bottle – a couple of tablespoons of room-temperature barbeque sauce mid-morning or mid-afternoon can straighten a guy’s day out pretty good, considering…. So, yes, while I was delighted to receive the gift of another bottle of barbeque sauce…. It was still just another bottle of barbeque sauce with an anthropomorphic label. I deposited it in our home refrigerator with other representatives of its breed and left it for a couple of days. Desperate for a little pick me up a couple of nights later, I opened the bottle and, not expecting much different than any other sauce experience, I poured about a quarter-cup into a small glass and left it to reach room temperature. That achieved, I drew about half of it into my mouth. Hitting my tongue, the sauce felt viscous but not runny. It opened up immediately with a little bit of heat, followed by a bit of sweetness, punctuated with little floating round things that tickled my tongue and that, when I bit on one or two of them, popped like small balloons and added a mustard-sweet flavor to the mix. “WOW” was the only word that came to mind. I poured the rest of the sauce into my mouth and rolled it across my tongue slowly. …my family member’s introduction. While it was sort of a cold introduction – an accompanying personal note extolling its many fine virtues or a texted testimonial about a particularly memorable personal experience with the elixir would have given me more confidence to taste it with less delay, it was a personal introduction nevertheless. Once again, you find a valuable lesson in the chaos of life. Nicely done… and that reminds me, I need to ask for those referrals.